Letter matching activities are an excellent way for preschoolers to explore the alphabet. 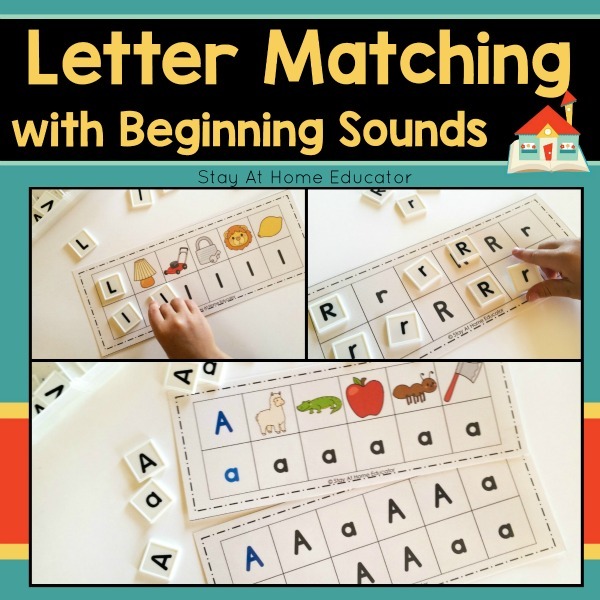 This is a very basic and easy upper and lowercase letter matching activity to reinforce matching letters of the alphabet in a fun way that preschoolers enjoy. 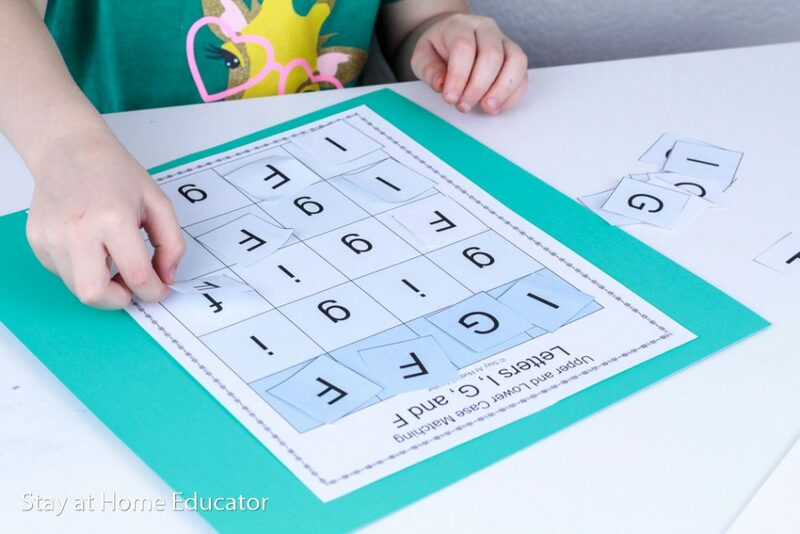 Use this FREE printable upper and lowercase letter matching activity to help solidify letter recognition in your preschool kids to help prepare them for reading. 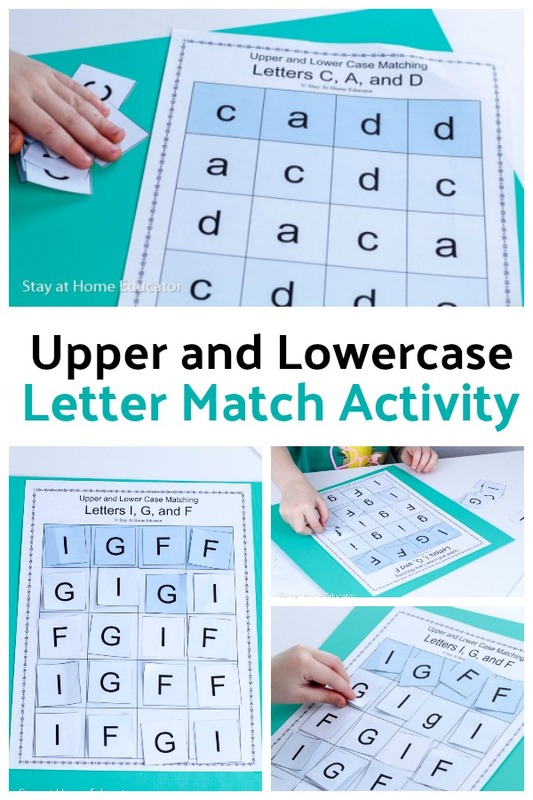 Don’t forget to grab your FREE upper and lower case letter matching printable at the end of this post! 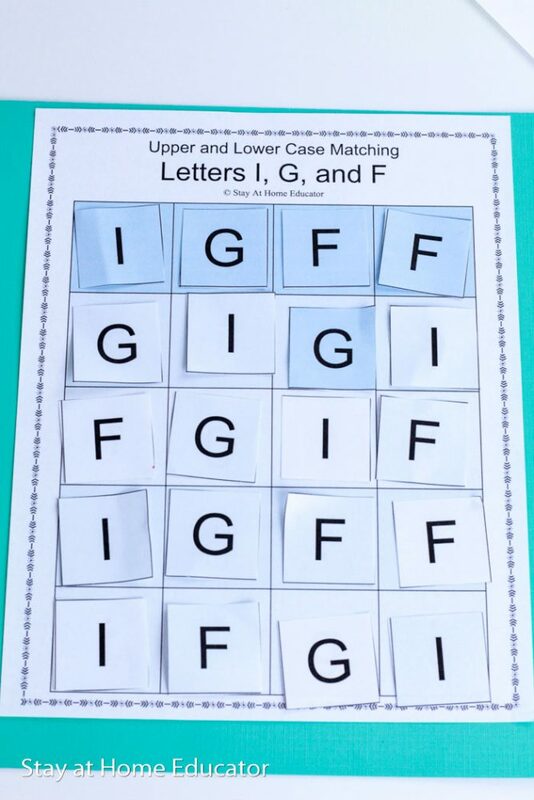 Free Printable Letter Matching Activity! 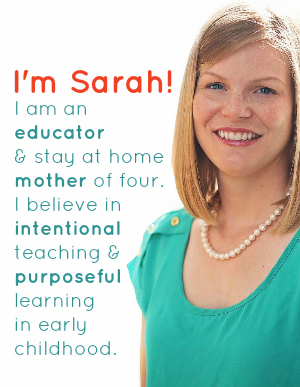 Even children as young as two years may begin naming and recognizing letters, especially those in their names or those that are frequently found in their environment. (Although let me be clear that is it completely OK if they aren’t). Those are always their favorite letters. Typically upper case letters are easier for children to learn because the straight lines and familiar “o” shapes are easier for children to recall than lower case letters which are often a mix of various shapes. Take the letter “g” for example. It has an “o” shape, a straight line, and then a hook for the tail. All those together is more difficult for a preschooler to learn than an upper case G which is mostly an “o” shape. 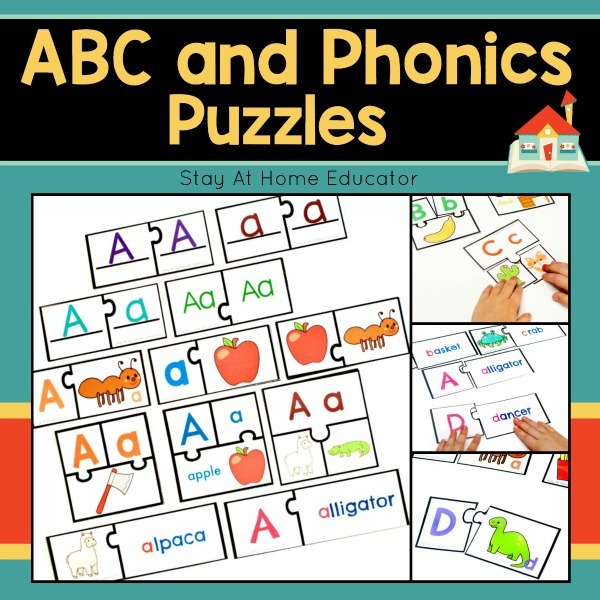 But soon, preschoolers are ready to begin matching upper and lower case letters, and letter matching activities like this one are a great place to start. This free alphabet printable follows the same letter order as my preschool phonics curriculum. In my phonics lesson plans, preschoolers are introduced to letters in the order of frequency of use in the English language. 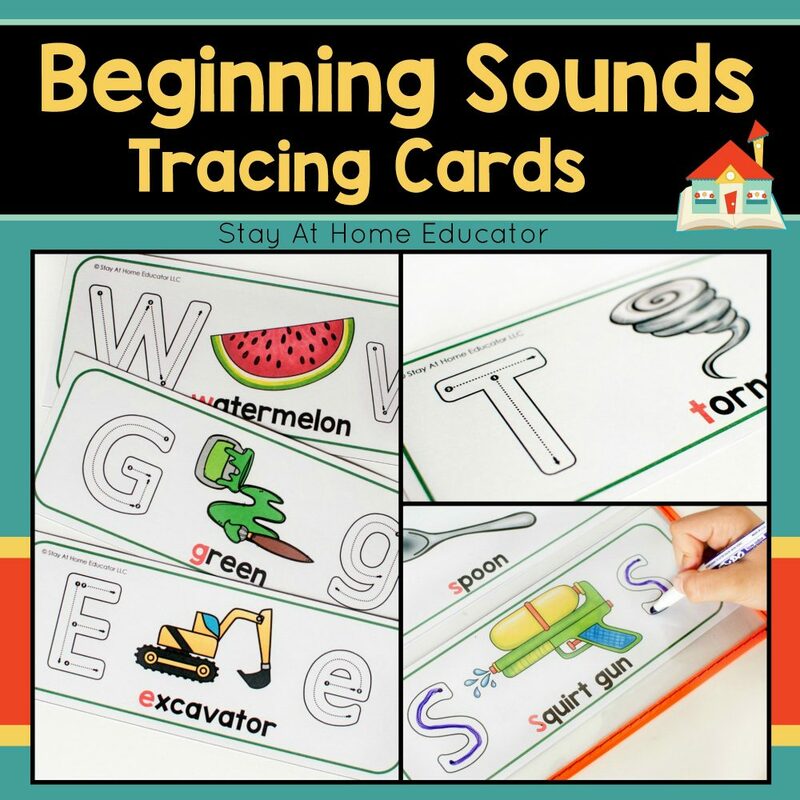 That way, if you happen to have a preschooler who is developmentally ready to start decoding words, she will already have a handful of sounds that when combined make up a lot of words! These are posts that teach children how to spell their names, or teach the letters of their name. 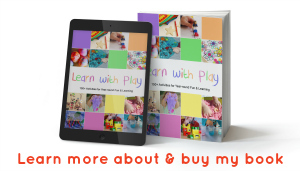 My favorite letter matching activities are simple and quick to prepare. You only need a few items. Tray (This helps preschoolers define their workspace). I like to laminate my cards so that kids can use them over and over again, but you can also use glue sticks to glue the letters in place if you don’t want to go to the trouble of laminating the cards. And parents like it when their kiddos bring home a letter identification activity like this one. Give each child a single grid, 15 corresponding letter tiles, and a glue stick all placed on a tray (skip the glue sticks if you’re doing this activity as a laminated activity). The object of the activity comes in two strides. First, have your students identify each upper case letter on the grid. With the repetition of the four letters throughout the grid, identification of the letters ia solidified. 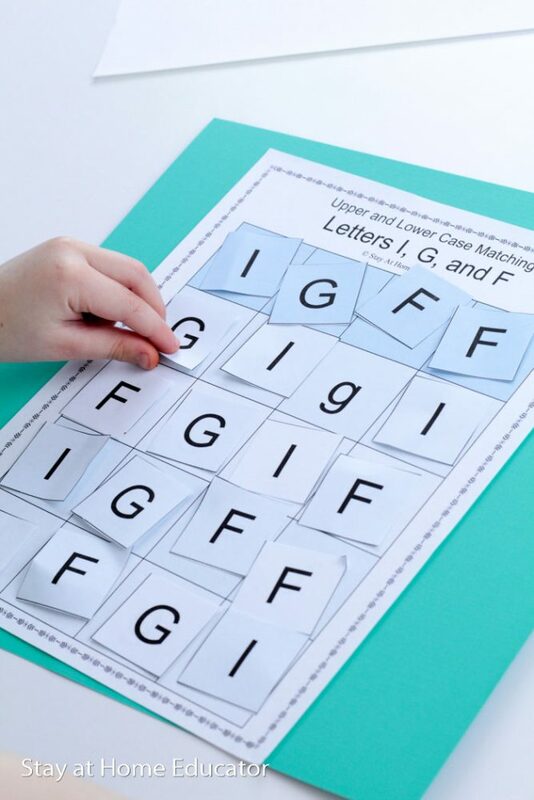 Next, show your students how to identify the lower case letters on the letter tiles and match with the upper case letters by gluing it on the grid. To prevent random gluing, (as I knew some students would immediately gravitate to), I made an extra copy of the activity and modeled it for the students. Once I modeled the concept with each letter, I asked the students to help me with the remaining letters. This is a traditional “I Do, Let’s Do it Together, You Do” teaching strategy). This ensured that all students knew exactly what to do when they received their own materials. I offered this activity to my three-year-old preschool class. While I was expecting it to be difficult for some of my students, it was received rather well. Surprisingly, our biggest challenge was not the matching of upper and lower case letters. Instead, it was learning to paste the letter tiles on the grid correctly. You know, put the glue on the back of the tile, not the front, and put the tile right-side-up? Just the little things you wouldn’t think would be a challenge, haha! 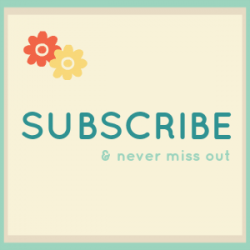 And more ways to use this printable! After all, a printable is only a good one if it meets your needs, so here are some ways to scaffold the matching activity to different learners. Invite individual students to name specific letters as you point to them. For younger learners, have the children sort their letters into piles before they begin gluing. Then they only have to worry about finding one kind of letter at a time. It’s less overwhelming that way. Use the letter tiles to spell out sight words or easy CVC words. When the grid is completed, invite your preschoolers to find small toys that begin with each letter and place them on the corresponding tiles. Don’t forget to grab your free printable at the end of this post, and then keep reading for more letter matching activities! These are some of my most popular letter matching activities for preschoolers. Thinking of objects that begin with the letter sound I was pointing to was difficult for the students. This is because it’s a skill that typically isn’t mastered until late preschool or not even until kindergarten for a lot of children. But this was a quick way for me to informally assess their letter/sound knowledge. And, when I named a word, my three-year-old students were easily able to identify if that word began with the same letter to which I was pointing. This is just like our sound matching activity I threw together with just a set of animals toys and a lot like our flashcard practice. This letter matching activity was an effective way to reinforce the letters we had been studying. It was an excellent review and the students were proud of their completed work and put it on display . Remember, this FREE letter matching printable practices the alphabet in the same order I introduce them in my preschool literacy curriculum, which makes these perfect for each review week! Don’t forget to keep reading for more letter matching activities! 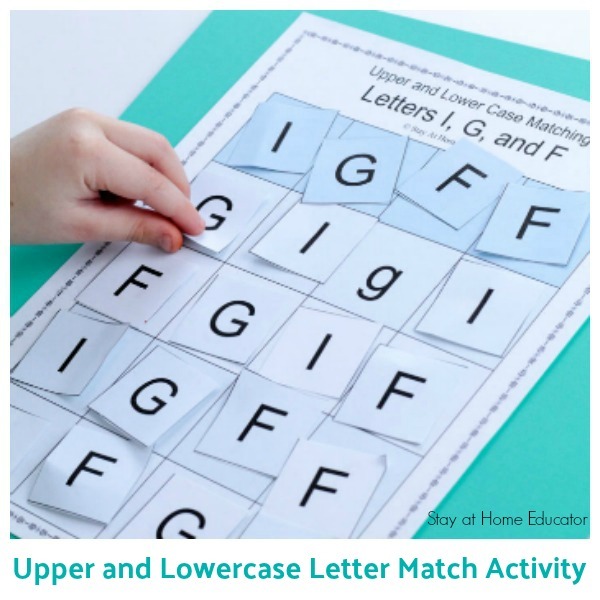 Looking for More Letter Matching Activities? 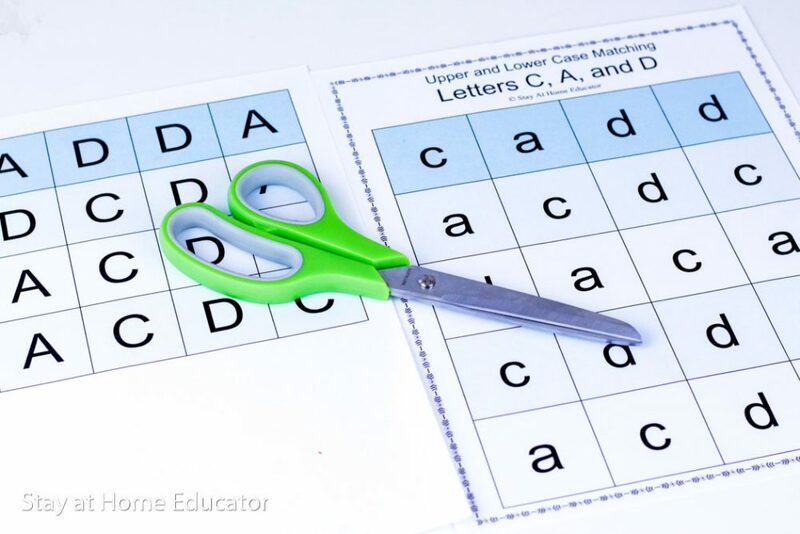 You might enjoy these other letter matching printables. 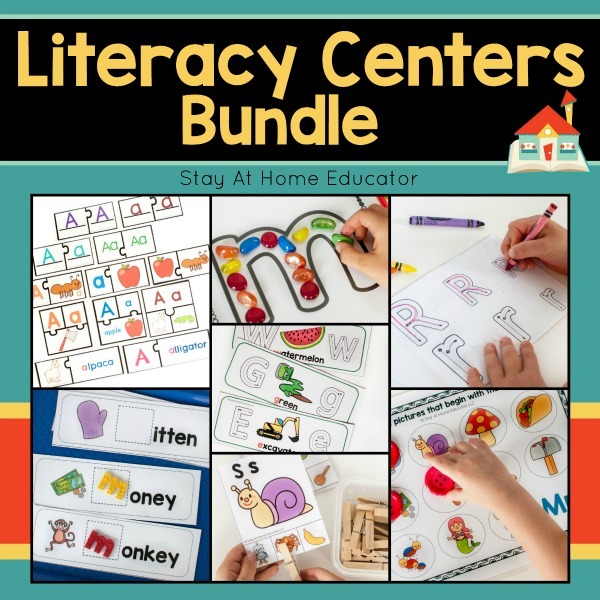 I like to use these as literacy centers. 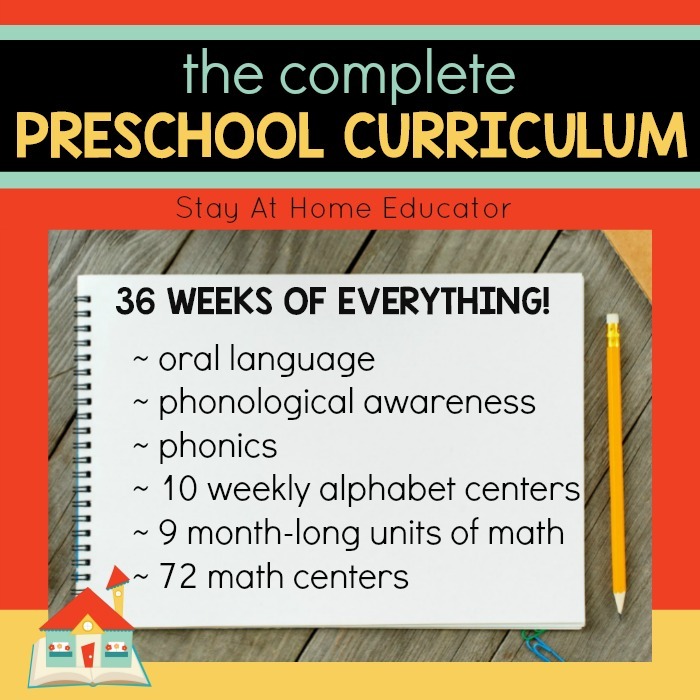 Want the Complete Preschool Curriculum?